Save The Bay educators are trained to use the augmented reality sandbox. 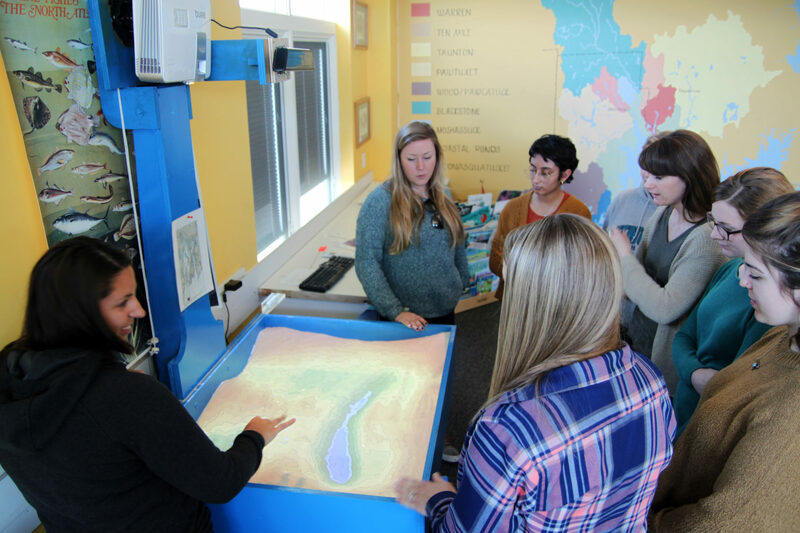 In an effort to illuminate watershed issues, Save The Bay educators are breaking into the virtual world with their newest technological acquisition: the AR (augmented reality) Sandbox. The first of its kind in the state of Rhode Island, this hands-on exhibit and learning tool goes online in Save The Bay lessons starting this month. “We want students to understand that anything they do on land has the potential to affect all of their water resources, from drinking water and irrigation to recreation,” said Save The Bay Education Specialist Letty Hanson. The complete AR Sandbox structure includes a seven foot projector stand and a raised 3.5’ long, 2.5’ wide and 8” deep sandbox. A digital projector is affixed above the sandbox, directed towards the surface of the sand. While not in use, the equipment could appear simplistic; however, when educators turn the machine on, a new understanding of this exhibit comes to light. Using a 3D camera and a video projector, the technology in the AR Sandbox works with the sculpted sand beneath it to produce a light-and color-based topographic overlay. As students shift the sand in the sandbox, the topographic map adjusts in real time, using a spectrum of colors and contour lines to bring the mock landscape below to life. The simulation adds bright blue pools to represent bodies of water at the sandbox’s lowest points, and those interacting with the sandbox can even use hand gestures under the projector to prompt a rainfall simulation. 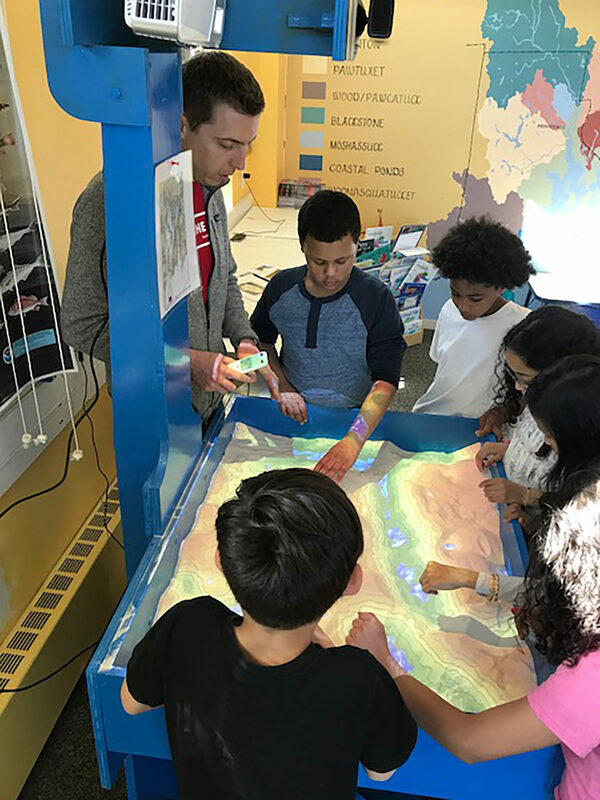 The technology in the AR Sandbox was initially developed in 2013 as part of an open-source program at the University of California, Davis by researchers looking to improve the instruction of earth sciences. Save The Bay’s education staff first set their sights on acquiring the sandbox in 2016, and their efforts were finally realized when funding was acquired in late 2017. Pfirrmann, assisted by volunteer Don DeLuca, began the physical construction of the sandbox in December 2017. By the following February, the sandbox was ready for its augmented reality technology. This final stage of preparation revealed the true complexity of the sandbox system, requiring the installation of three software packages, two types of hardware calibration, and the configuration of a Linux operating system. Now, the AR Sandbox is ready to be used by Save The Bay educators as they introduce students to watershed issues. 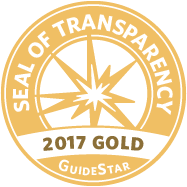 “It adds another layer of hands-on learning while helping students develop the STEM (science, technology, engineering and math) skills that are so crucial to their success. This resource will help students develop their critical thinking and problem-solving skills when it comes to their place in the watershed, and our program will encourage them to incorporate solutions to everyday challenges we face in the Narragansett Bay watershed,” said Save The Bay’s Education Director Bridget Kubis Prescott. During lessons at the Bay Center, students will be asked to consider all of the forces at play within a watershed—from the pull of gravity and the consequences of rainfall to the complexity of tributaries—while gaining the vocabulary needed to describe coastal features. “Since Save The Bay’s mission is to protect and improve Narragansett Bay, teaching students about watersheds is crucial so that they can make informed decisions when it matters,” said Hanson.